A third woman has reportedly accused leading Republican presidential candidate Herman Cain of inappropriate behaviour in the workplace. She alleges she received unwanted comments from Mr Cain during his tenure as head of a restaurant lobby group. She told the Associated Press Mr Cain had commented on her attractiveness and invited her to his corporate apartment. The unnamed woman is the third former employee to make such allegations in recent days. The Cain campaign blamed the leak on an aide to Republican rival Rick Perry, who worked alongside Mr Cain on a failed Senate bid in 2004 and was said to have learned about the allegation. Rick Perry's campaign denounced that allegation as "reckless and false". Mr Cain's aides have been fighting sexual harassment claims since Politico reported on Sunday that at least two other women had complained of inappropriate behaviour from Mr Cain while he was head of the National Restaurant Association in the 1990s. A Cain spokesman, JD Gordon, told reporters on Wednesday: "Mr Cain has said over the past two days at public events that we could see other baseless allegations made against him as this appalling smear campaign continues." 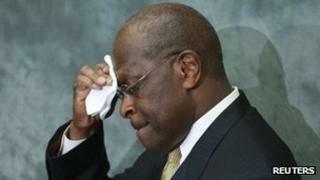 The third woman to come forward told the Associated Press that she had considered filing a complaint against Mr Cain. She said her former boss had made sexually suggestive remarks or gestures around the same time the two other women filed their complaints. The woman, who wishes to remain anonymous, says the reason she did not eventually file a complaint was because she started to have fewer interactions with Mr Cain. Speaking to the Associated Press, the woman said Mr Cain's actions "were inappropriate, and it made me feel uncomfortable". Republican pollster Chris Wilson, who supports Texas Governor Rick Perry's presidential campaign, said he witnessed Mr Cain sexually harass a woman in a restaurant near Washington DC. He told Oklahoma City's KTOK radio that "if she talks about it, I think it'll be the end of his campaign". Recalling the alleged incident in the restaurant, the Oklahoma-based consultant told Politico: "It was very uncomfortable," and said that others present had asked Cain to stop. However, one woman who worked with Mr Cain at the restaurant association has stood up for him. Lobbyist Christina Howard told the Associated Press: "I found him to be a good boss. I felt no problem going into his office and asking for his advice." On Wednesday, after a speech to healthcare professionals Mr Cain refused to take questions - at one point raising his voice in frustration - and left the hotel in Washington DC through a back door. "What did I say?" said Mr Cain. "Excuse me. Excuse me! What part of 'no' don't people understand?" In an interview with Forbes, Mr Cain accused a former adviser to his unsuccessful Senate campaign in 2004, Curt Anderson, of leaking the original story. Mr Anderson, who is now an adviser to Mr Perry, has denied the accusation, saying: "I never heard about this story until I read about it in Politico." The Perry campaign suggested the campaign of another Republican candidate, Mitt Romney, might have been the source. On Tuesday, the lawyer of one of the original complainants said he had contacted the National Restaurant Association to ask for his client to be released from her confidentiality agreement. Politico has reported that the trade group gave settlements to at least two female employees who accused Mr Cain of inappropriate sexual behaviour. The New York Times reported on Tuesday that one payout was $35,000 (£22,000), equivalent to a year's salary for one of the women.